Sometime it can be difficult to know what to do when it comes to parenting. There are so many different child-related topics, with so many conflicting sources, that it’s understandable if you find a lot of information goes over your head. One book may say to do one thing, regarding, for example, putting your child to bed, and yet another may have a totally different method, condoning the ideas of the first book. Likewise, parenting websites may cover several topics in different ways, leaving it up to you to find what works best. If the whole process of parenting without some sort of guide is daunting, then you could always seek the help of someone who has put their own parenting ideas to the test and created their own amusing YouTube channel. 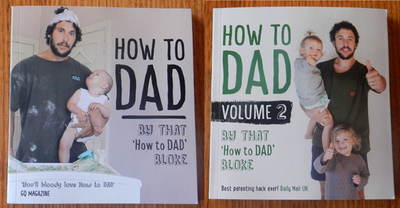 With over 150,000 subscribers, New Zealand funnyman Jordan Watson has quite a following with How To Dad, and has since released two gift ‘guide’ books that extend on his channel’s popularity. While his sense of humour is simplistic at best, it can also be quite amusing (and very true to life). The ‘tips’ listed in these books are presented as photo stills with captions, yet most have featured at some point as videos on his channel. He has also included little anecdotes (‘dadvice’) within the pages, including some troubleshooting methods if these don’t work according to plan. For example, if you want to read a story to your child every night, and they insist on choosing the same book time and time again, you can change it up by putting on different voices for the characters and bringing the story to life in an Oscar-worthy performance. While it may not compel the little ones to sleep, it will make the repetitive process much more enjoyable for you! He has also included several scribble pages throughout the books (for the kids, not you), and lives by the theory that a thumbs up or high-five are adequate rewards for a job well done. If making wheelie-bin castles, teaching your child to run, or learning how to feed/change a nappy/clothe your baby (without gagging or making too much of a mess) is a priority as a new dad, then this may be just the humorous guide book pairing that you need.